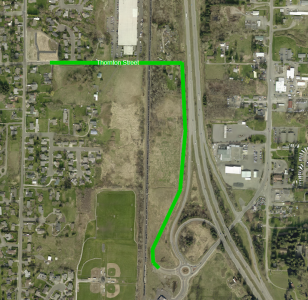 This sanitary sewer extension project will install a new sanitary sewer gravity main on Thornton Street beginning east of Malloy Avenue and will extend to Portal Way, via a bore under the Burlington Northern Santa Fe (BNSF) railroad tracks. This project also has the benefit of diverting significant wastewater flows to the system on Portal Way and thereby allows the City to eliminate the need to upsize several segments of existing sewer collection mains located along a corridor between Malloy Avenue and BNSF’s tracks. Construction is anticipated to get underway in fall of 2017.